Is the European Union Exporting Torture Devices? The European Union likes to cast itself as a champion of human rights, both at home and beyond its borders. So why is the E.U. allowing European firms to export thumbscrews, stun guns and other devices that could be used for torture to countries with spotty human-rights records? According to the human-rights watchdog Amnesty International, businesses making these types of implements are flourishing in Europe and exporting their products in spite of an E.U. ban on the trade. In a report released earlier this month, Amnesty said firms in Germany, Spain, the Czech Republic and Italy were selling items like electroshock "sleeves" and "cuffs" capable of delivering 50,000-volt shocks, spiked batons and fixed wall restraints to at least nine countries, including Pakistan, China and the U.A.E. Amnesty, which co-published the report with the London-based Omega Research Foundation, says the companies are using legal loopholes to evade restrictions put in place after the E.U. passed a law in 2006 banning the sale of torture equipment. One tactic is to simply relabel torture implements that are on the E.U. 's list of banned products. For example, electroshock weapons like stun belts  which are placed around detainees' limbs and emit a shock if they get out of line  are sometimes renamed "stun cuffs," Amnesty says. Another scheme is to sell "dual-use" items, such as leg shackles and stick batons, which are allowed to be exported for policing and security purposes. The trade in dual-use products is meant to be closely monitored, but Amnesty says little is being done to make sure the devices are not being used for torture. Amnesty executive officer David Nichols, who co-authored the report, says E.U. governments are failing to live up to their responsibilities. "There does not appear to be any political will to deal with this problem and close the loopholes," he says. "The 2006 rules were a landmark move to counter torture, but the E.U. isn't doing enough to make sure they work properly." Only a few manufacturers are named in the report. An official at one company known to produce such items, the Belgian firm Sirien, denied any wrongdoing in an interview with TIME. Sirien makes products like electric-shock stun shields and S-200 projectile stun guns  devices that export manager Erwin Lafosse insists save lives. "If you want to ban electroshock pistols, then policemen will have to use firearms to defend themselves," he says. "The problem with Amnesty International is that they only see the bad side to everything. Yes, these can be used to torture someone, but so can all sorts of ordinary devices like knives, forks and spoons." 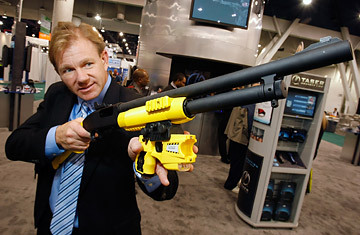 Nevertheless, the company removed the stun shield and stun gun from its website after the Amnesty report was released. Frank Coll, head of another firm in Spain called Nidec, which was named in the report, says his company removed its stun cuffs from its website after receiving a letter from Amnesty International alerting it to the new law in 2006. "That was the end of the story for us  we have not sold this item at all," he says. The report is alarming politicians enough for the European Parliament to intervene: members are expected to raise the issue at the body's next session in April. "The E.U. 's inaction is unacceptable and I'm bitterly disappointed," says British M.P. Richard Howitt. "It's complacency: the E.U. 's member states and institutions have taken their eye off the ball." Heidi Hautala, who chairs the parliament's subcommittee on human rights, has also pledged to force the E.U. member states to close the loopholes. "E.U. governments simply failed to take the rules seriously enough," she says. "It is shameful  the E.U. can talk but not deliver. It cannot portray itself as a human-rights model to anyone until it can put its house in order." But for some observers, it's naive to expect the E.U. to maintain a perfect record on human rights. "It would not be the first time the E.U. is going against its values, and its own interests," says Andrew Stroehlein, a spokesman for the International Crisis Group. Stephan Keukeleire, a professor of foreign policy at Leuven University in Belgium, points out that any E.U. claims of ethical foreign policy were already undermined by the fact that its members are among the biggest arms exporters in the world. "We too often talk about the moral side of our actions, and we too often say we have a superior Western foreign policy, when obviously commercial considerations come into play. Remember, most of Saddam Hussein's weapons technology came from the West," he says. But Keukeleire is hopeful that the mood is changing, in part thanks to Amnesty's report. "At least now there is more of a recognition of the problem. But it will take time."